You place some change on the table...Two Eisenhower Silver Dollars, a Half-Dollar and a Quarter. One at a time, you place each coin in your fist. As you do so, add up the dollar value. Remove ONE coin and put it in your pocket. Ask the spectators how much money is left. No matter what they say, they are wrong! Open you hand and it's empty! Self Working. 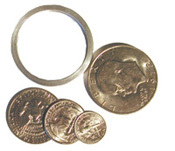 $2.85 Coin Trick comes with gimmicked silver dollar, half dollar, quarter, dime, bang ring and instructions.